Bench pressing with chains is a powerlifting technique, however it can be used by any weightlifter to strengthen your bench press. Since you will be lifting greater weight, you will also be stacking muscle mass to your frame. Prepares you to handle heavier weight: With chains, the barbell is lighter at your chest with chain ‘piled’ on the floor. As you lift the bar, the chains come off the floor making the weight heavier as you near lockout. Your 1RM with chains (at lockout) will be heavier than your bench press 1RM, conditioning your body and central nervous system to handle heavier loads. Build explosive power: Since the bar is light(er) at your chest, you can drive the bar very explosively off your chest. Allows you to accelerate through your sticking point: Since you’re driving the bar off your chest with explosive power, you train to drive the weight right through the sticking point. Build bench press lockout strength: Weight increases as you lift, getting heavier as you near lockout. Chains: An effective lifting chain is a 5′ section of 5/8″ chain. This averages approximately 20lbs (9kg) in weight per section. It is good practice to weigh your chains so you know how much weight you’re adding. Connector Chains: All you need to hang your chains from the barbell is a section of lighter weight chain and connecting hardware. A 5′ length of connecting chain will be more than you will need for the bench press, but will allow you to use it for squatting with chains as well. Connecting to the Barbell: Simply loop your connector chain over the end of the barbell. You can then connect your weightlifting chain directly to the connector chain, or even simply feed it through the loop of the connector chain. Collars: Place the collars on the outside of the chain to hold it in place, and make sure it is secure. For added security, you may even place a small (2.5lb/1.25kg) weight between the chain and the collar. Chain Length: Adjust the length of you connector chains so that the chain just grazes the floor when you are locked out. 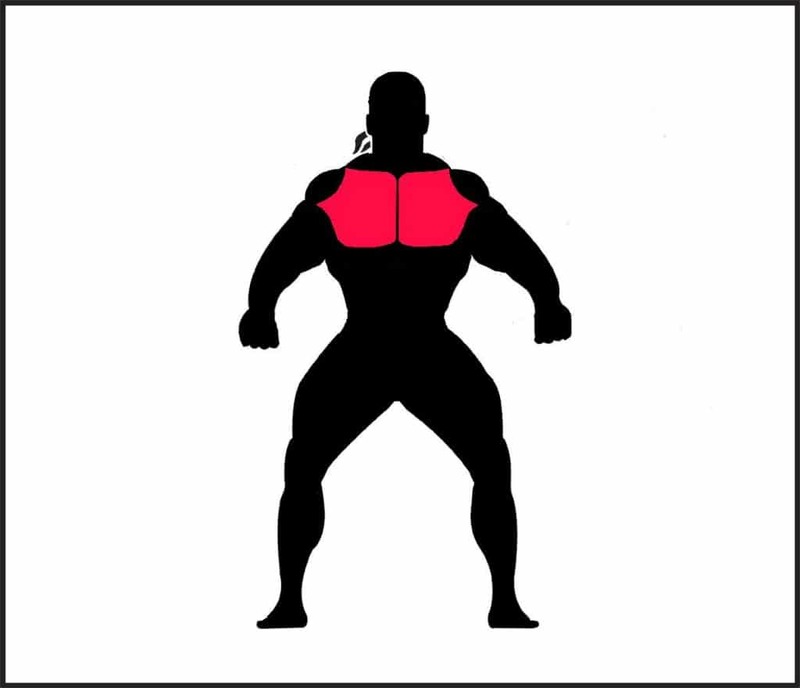 This will give you the greatest variation in weight between the locked out, and bar at chest positions. If the chain is adjusted too high, the bar will be on its way down before chain begins piling on the floor. This will increase the weight at your chest. If the chain is adjusted to low, it will already be piling on the floor before the bar descends. You will not get the full weight of the bar and chain at lockout. Either of these scenarios reduces the effectiveness of the chains. Exercise Execution: Bench pressing with chains uses the same technique as a normal bench press, so I won’t cover all the nuances here. If you want tips on proper bench press technique for power, you may want to read my Bench Press Technique article. Bring the bar to your chest quickly, but with control. Drive the barbell off your chest explosively. Since the weight will be lighter on your chest, concentrate on getting as much speed as possible from the start. Continue driving the weight with all your force as it gets heavier until you lock it out. When using chains, use a significant percentage of bar weight in chains. Lockout weight with chains should be relatively heavy, no less than 70% of your 1RM. Repetition ranges per set should be in the strength building range: 3 – 5 reps per set. Failing to set the chain length correctly: To maximize the effectiveness of this exercise, you want the maximum variation in weight from bar on chest to lockout. Using to little chain weight: If bar weight is too heavy in relation to chain weight, you will not get as much explosiveness off the chest, reducing the effectiveness of the chains. Poor bench press form: You should learn effective bench press technique before attempting to use chains. You will be performing this exercise with a relatively heavy amount of weight and should make sure you are healthy enough to perform the exercise safely. Consult with your doctor before embarking on any new fitness program. Chains on your barbell are inherently unstable, they will sway from side to side a bit when you unrack the bar. Additionally you should be using a significant amount of weight for this exercise. Make sure your spotter pays close attention, particularly as you unrack the bar. Since the chains are unstable, if they are not well secured, they are more likely to slide off one end of the barbell than a weight plate is. This could leave your bar weight significantly unbalanced and lead to injury. Make sure your chains are well secured on the bar with a collar. To increase stability, place a small weight between the collar and the chain.